I have a weak spot for Caribbean movies and wish they were made more frequently. It's about time the VI is represented. I'm excited and can't wait to see Chance The Movie, especially since it was filmed on St.Thomas, my home. 'Chance' is slated for completion in 2011, and will be making rounds on the festival circuit; hopefully with huge success. After receiving an esteemed photography scholarship to the university of his dreams, Darnell Smith’s life is turned upside-down when his mother’s ongoing illness suddenly becomes severe. With no one to provide for his family, Darnell takes measures into his own hands. The first collaboration between screenwriter Mark Owens and director Evan Kaufmann, Chance is a sun-soaked drama that doubles as an exposé on the seedy underbelly of organized crime and human trafficking in the US Virgin Islands. 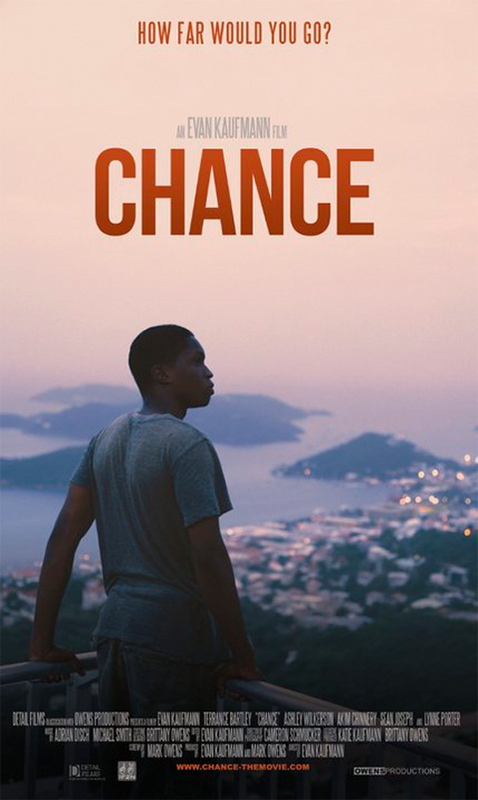 Chance chronicles the actions of Darnell Smith, a young, big-hearted St. Thomian, who is the sole breadwinner for his family and whose skills as an amateur photographer have landed him a scholarship to an esteemed school in the States. But with graduation inching closer, Darnell’s mother slips closer to death from an undiagnosed disease. Lacking the funds to afford treatment and with no one to look after his brothers and sisters, Darnell forgoes school to team up with a local crime lord in a desperate move to take care of his family and save his mother’s life.